Computers seem to be replacing humans across many industries, and successfully so in the service sectors such as bank and hotel lobby ATMs and airport kiosks, reports The Wall Street Journal (Oct. 6, 2013). But these tasks—along with more routine computerized skills like robotic assembly lines—share a common feature: they’re very narrow, specific, repeatable problems, ones that require little physical labor and not much cognitive flexibility. 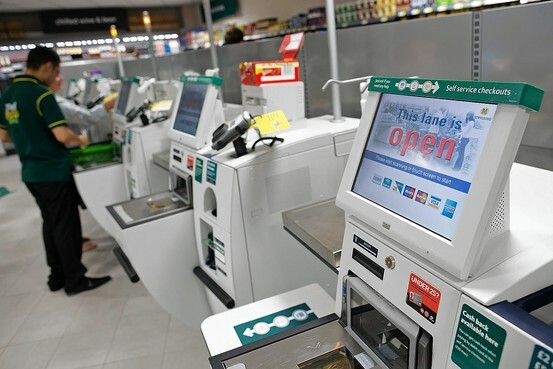 In supermarkets, self-checkout machines’ deficiencies illustrate the limits of computers’ abilities to mimic human skills. The human supermarket checker is superior to the self-checkout machine in almost every way. The human is faster. The human has a more pleasing interface. The human doesn’t expect us to remember or look up codes for produce, she bags the groceries. Self check-out works well enough when you want just a handful of items, when you don’t have much produce, when you aren’t loaded down with coupons. What’s so cognitively demanding about supermarket checkout? Checkout people all point to the same skill: identifying fruits and vegetables. Some supermarket produce is tagged with small stickers carrying product-lookup codes, but a lot isn’t. It’s the human checker’s job to tell the difference between green leaf lettuce and green bell peppers, and then to remember the proper code. “It took me about three or four weeks to get to the point where I wouldn’t have to look up most items that came by”, said one clerk. National supermarket chain Jewel-Osco is getting rid of self-checkout lanes from some of its stores. The firm said it’s an effort to reconnect personally with all of its customers despite the higher costs the shift entails. Theft is also a concern driving some grocers away the unmanned check-outs, as are hassles such as liquor and other purchases that require an employee to step in. Self check-outs generally have one staff member assisting customers at 4-6 stations at once.